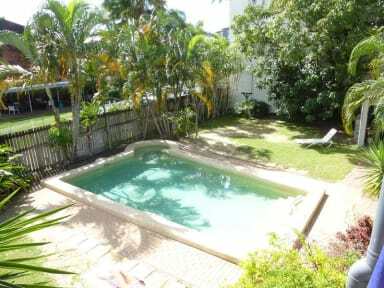 Lazy Duck Backpackers i Cairns, Australien : Boka nu! Fast FREE WiFi in all areas. All dormitory style accommodation features air conditioning 24 Hours per day, garden views and linen supplied. It has access to shared bathroom facilities. We have no lock out and you can access your room 24 hours per day. Come and meet great people when joining our events. We have our famous BBQs on Thursday, Trivia Nights, Movie Nights and much more. We now offer free breakfast! Ok place for the price, I mostly slept well - comfy bed and usually pretty quiet at night due to night guard always present (sleeping in the hostel. The last night I didn't get much sleep though due to noisy people hanging at the pool til 2am (had to wake up at 5:30 to catch a flight), don't know where the night guard was that night.. Kitchen is falling apart, dorm mostly dirty even though they cleaned daily - so staff did it right, just the people was dirty and leaving hair all over the place.